Im just tryin this out for a contest. Please give me ideas to make it look better. Thanx. Where is this contest held at? Online? Yes. Its my rap site. You should change the color scheme in such a way to focus the atention on the product. Right now the background is grey and the PS is grey too. Is kinda hard to make the difference between them. The overall design is fine but some of the details need a little work I think. 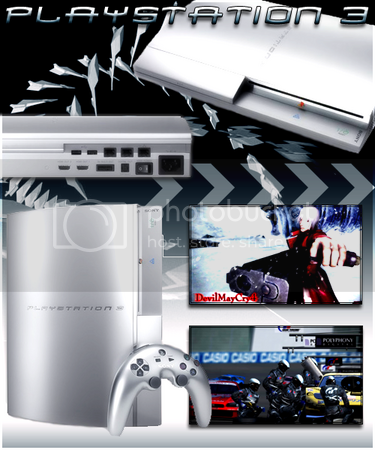 For example I really can't say that the 'taped screen shots' go with the futuristic style of the background OR the PS3. Also, to contrast a little of what Oviska said, I think that you could just tone down some of the background details to make the foreground stand out rather than changing the color scheme you already have set out. As some final thoughts, the text, in my opinion, looks a bit wide on the page, and, if this were my project, I would probably try to connect the background to the foreground physically in some way so that it doesnt look like everything is floating in free space. Maybe I'm nitpicking at it by those are the things I see that could use some improvement. However not to discourage you I honestly think the idea and layout are great. No its fine. I actually remade this, only with a different scheme. Same colors but different scheme. i agree that the second one looks better, but i think that the first would beat it by a long shot if you added blue (and maybe some outer glows) like sevenlee suggested; whatever blue you say is on there now is definitely not visible. I think the font could look a little better. Maybe make it more crisp and smooth. I also think the pictures/screens could be higher quality. Overall looks nice though. If I may, the background looks somewhat flat. Try giving more 3d dimension to it. And try to make it more simple (now look crowdy). Also your composition have no center of atention so when I look at it I don't know what is the Subject. No intention to disregard the fine idea that you had, just trying to clear it up. See thats what I was saying about the background as well. I don't think it, itself, is flat though I just think that the foreground makes it look flat because everything just appears to be sitting a few inches infront of this canvas that is the background. I will again suggest, even with the new one, to try somehow incorporating the background into the foreground. As well, I agree with some of the comments made about the text. There is a free font called SF Movie Poster, and I think that if you tried it (as long as you're using all capitals anyways) it would really work for this. the first submission's back ground was great and fine... it just seems like everything really stands out too much. i'd say dull it down a bit. I don't like the contrasty images in the bottom corner of the games. Also, try making the entire thing less complex, its hard to easily comprehend.